The Alphabet Shop is a family owned business that has been manufacturing quality signs for over 48 years. But we aren’t that cookie cutter shop that makes the standard nameplate and office signs. While we can of course take care of your standard building signage we can also create custom signs that will transform your office space. 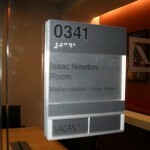 We can manufacture a dimensional logo for your lobby sign which tells people who you are when they enter your building. There are endless choices of materials to pick from when creating your lobby sign. 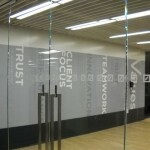 Whether you want stainless steel, etched acrylic, wood grain or a digital print… we can accommodate your design. Now not all interior signs need to be your actual logo. There are so many ways to express your company through simple pictures and words. For example, some corporations take the words from their mission statement or the words that their business stands for and digitally print them. 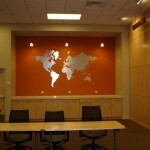 Some companies take pictures that represent their business, or their locations across the United States and turn those ideas into wall art. 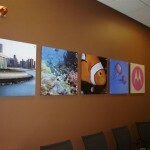 These prints can then be mounted directly to the wall, on standoffs or by a cable system. Another office sign that we have created is a dimensional world map which can even be labeled to show the corporations multiple locations. This is a great way to show the capacity of you business right through your lobby sign. These maps can be manufactured out of different thicknesses and different materials. Laminates can also be mounted to the face of acrylic to make the material appear to be metal, granite or a million other design options. If your company is worldwide, this is a visually appealing way to represent that. Now as I said before, some of your office signs will be standard building required signage. This doesn’t however mean that they need to be boring and unappealing. Your fire evacuation signs, nameplates, restroom signs, elevator signs and more can all be custom designed to match your business. There are various ways to manufacture these building signs so that they can be labeled permanently or with a message insert system so that changes can easily be made. With a message insert system (MIS) you can re print the inserts at your own location so that things like employee names or even daily meetings in a conference room can be listed right within your sign. The point here is that The Alphabet Shop can make your custom office signs the way you want – when you want. Call us today at (800) 882-3151 or visit our sign company website and let us start your project! See some of the examples below.